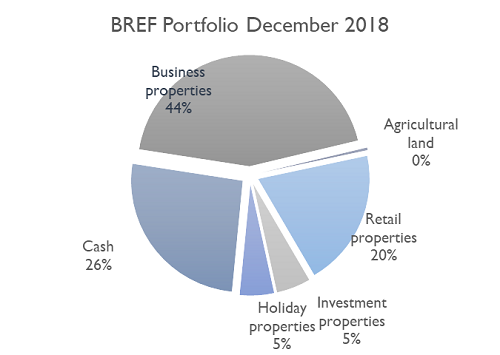 BREF has a diversified portfolio, allocated in business (44%), retail (20%), investment plots (5%), holiday properties (5%), agricultural land (0.4%) and cash & cash equivalents (26%). four projects in the pipeline. From the five ongoing projects “Mr. 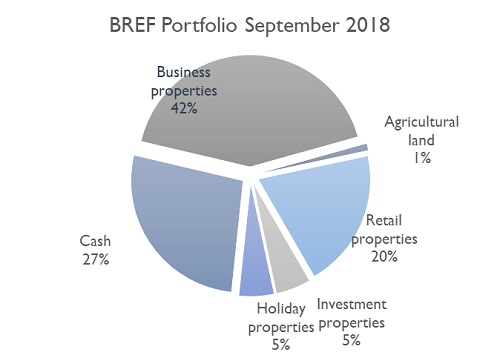 Bricolage” – sale and leaseback, Agricultural land, Office building 1 in Business Park Sofia, Office building Kambanite and the office building in Sofia Tech Park are currently operational. Apartment house “Sequoia II” in Borovetz is set for sale. The next group consists of projects in the pipeline or suspended and currently there is no progress in their development. Such projects are Seasde Holiday Village in Lozenetz, Investments plots near Veliko Tarnovo and Vidin, and in Sofia in Mladost IV district.